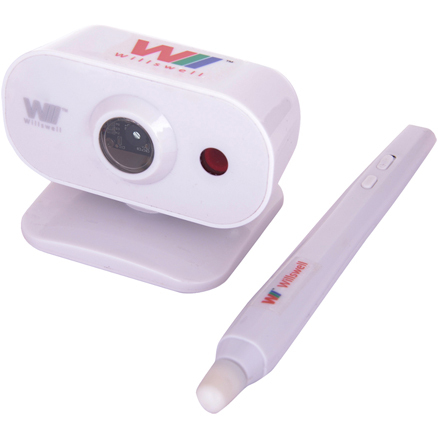 Frameless interactive whiteboard kit portable USB device that converts any standard whiteboard or plain wall on screen into smart interactive pen touch screen using U-Pen stylus. 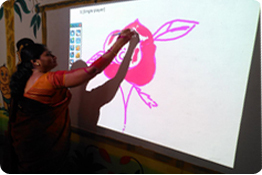 Save space required by traditional with frame smart board, can be carried and used in multiple rooms on the go. Turns trainings/meetings/classrooms into more fruitful, interacting and interactive seesions. Keep audience engaged and more attentive. 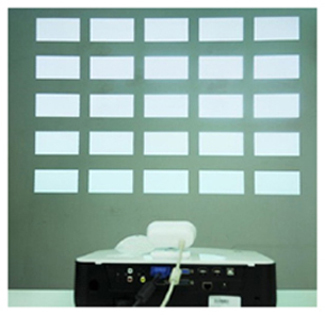 Infrared based interactive board which converts any plain wall, standard whiteboard or green board ino interactive display. 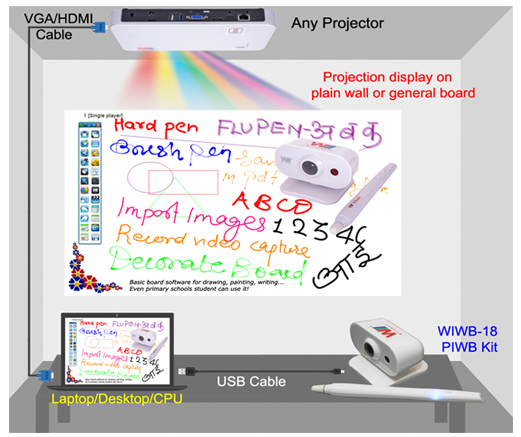 Any projector that projects display of window or Linux based PC, Laptop or CPU is Ok for white board application. Long throw and short throw interactive kit models available to match with your existing long throw or short throw projector. Smaller body, Powerful Interaction,Plastic shell,after highlighting process, it’s more cute and exquisite; Can work with any projectors, no matter, what brand, no matter what configuration, it can work perfectly to realize interactive function. Smooth handwriting with light weight high stylus U-Pen with rechargeable built in battery & Laser pointer.Innovative design with weight as low as 43 gm. User can use it like a ball pen or white chalk. Offers very smooth and fast hand writing on any plain surface. Combined with ergonomics, curved body design, makes your hand more comfortable when writing with it. 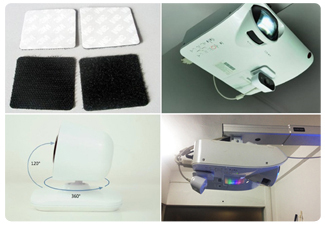 Easy Installation Rx Camera kit be fixed to the projector using velcro stickers. Camera can be removed and re-attached to the velcro sticker in no time. Short throw model can be used with long throw projector using wall mount bracket. The camera can also be operation when placed on top of the projector when dest /table mounted. Any projection size between 60 inches to 120 inches can be turned into interactive display. The Rx Camera kit placement disctance depends on the size of the projection display. 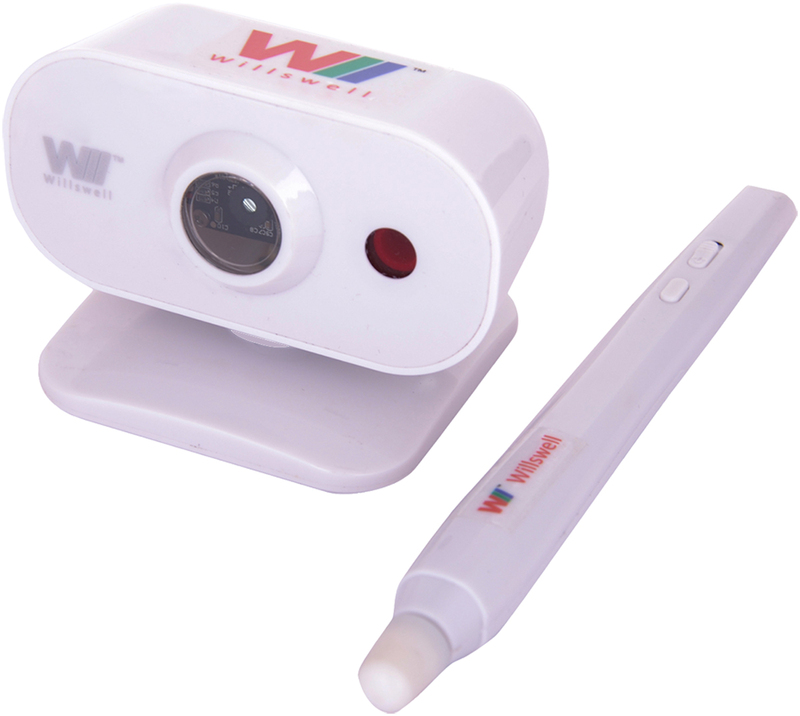 Two software provided with the kit for using as whiteboard. Make any normal projector to be interactive. Small size, extremely easy to carry. Easy to install and use, plug & play. Projection size can be 60 to 120 inches. 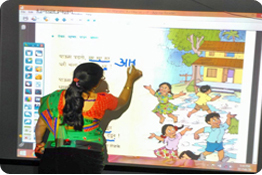 No need to reinstall/alter projectors to match with smart board installations. Can be easily fixed to the projector using well crow stickers. U-Pen with weight as low as 43gm. User can use it as a ball pen or highlighter pen. 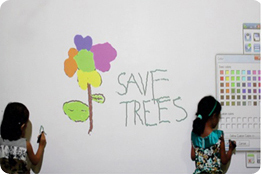 Offers very smooth writing on plain wall or any white or green board. Rechargable battery inside the U-Pen. Laser pointer available inside U-pen. Built in flash memory that remembers that previous calibaration settings. © 2016 Willswell. All Rights Reserved.